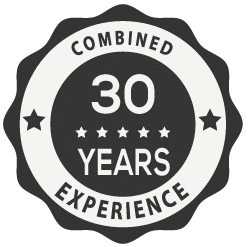 Our team has over 30 years of combined experience in helping people find the best option to consolidating debt. You tell us about your Debt Relief Objectives and the types of debts that you want to consolidate. Client # 16076 needed Debt Consolidation help due to unexpected expenses and an increase in the cost of living. Being on fixed income, the client relied on borrowing money to pay for the unexpected expenses. Soon the client realized making minimum payments on the debts was not helping pay the debt off and hired CWDR to help solve the problem. CountryWide Debt Relief was able to help Client #16076 with $34,140 in debt, become Debt Free in 41 months. Making just the minimum payments on the debt, client would have had to pay a total of $88,241; therefore, Client saved $67,367 in finance charges by hiring CountryWide Debt Relief. *Do nothing option assumes making only the minimum payments on the debts each month with APR of 17% and minimum payment of 2% of the outstanding balance each month. Savings illustrated is the difference between the total payments to CWDR and Total payments if just the MINIMUM monthly payments were being paid on the debts. "I would like to take this time out to thank you for all your help... your Debt Relief Program was the best thing I ever did … I have already recommended you guys to a few people who I know are trying to get out of debt. Words cannot describe how grateful I am for everyone's help. I didn't think I would ever find a solution to my problem. Thanks so! so! much. I wish I could hug everyone there I really appreciate so much what you have done and what you are still doing." Approval is GUARANTEED*. Process is FAST and EASY! Copyright © 2019 CountryWide Debt Relief | All Rights Reserved. DISCLAIMER: Debt Consolidation Program (“Program”) also known as Debt Relief or Debt Settlement serviced thru CountryWide Debt Relief (“CWDR”) refers to clients who have enrolled in a Program with CWDR. Whereas CWDR shall work aggressively to negotiate the Program Debt, not all debts can be negotiated and not all creditors negotiate. Individual Program results may vary and are based on but not limited to the ability of clients to save funds and successfully complete their Program terms and conditions, the amount and type of debts and creditors, history of accounts and financial standing of clients. Any specific or general reference to “debt free”, “savings”, “eliminate” or “reduce” debts only refers to clients that have successfully enrolled and completed their Program resulting in all Program Debt being settled for less than the original balance enrolled. 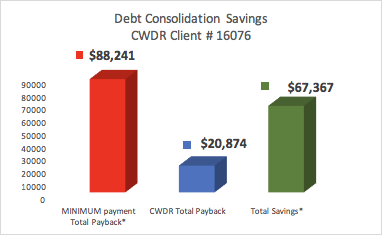 Any figures given or statements made are examples of past performances and are not intended to guarantee future results and CWDR does not guarantee that debts successfully enrolled in the Program will be settled, lowered by a specific amount or percentage, settled in a specific time period or that clients will be “debt free” in a specific time period. All Program terms and conditions are subject to change without notice and not all applicants are approved. The Program is not available in all states and other restrictions apply. Read and understand all Program materials prior to enrollment, including potential adverse impact on credit rating. CWDR is not a law firm and does not provide any legal, bankruptcy, tax or accounting advice or credit repair services and anyone considering bankruptcy should consult a bankruptcy attorney. Please contact a tax professional to discuss potential tax consequences of the Program. Depending on your state, we may be able to recommend a Bankruptcy attorney. Depending on your state, we may be able to refer you to our lending partners for a Debt Consolidation Loan. Annual Percentage Rates provided by our lending partners range from 5.99% to 35.89%. Please note that calls with the company may be recorded for quality assurance. 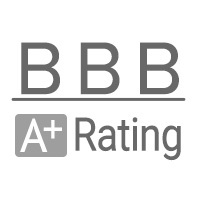 **Approval Guarantees are based on: Minimum of $10,000 in credit card debts and the ability of the client to afford a minimum of $250 monthly payments.